The Gowanus Lounge: GL Analysis: What is a Fair Price for History? GL Analysis: What is a Fair Price for History? Saving a slice of Brooklyn's and America's history, we are learning, may have a very small price tag. Yet, it's one that a host of local officials seem unwilling to pay. The report that was delivered to a public meeting about Officer's Row at the Brooklyn Navy Yard on Tuesday night said that the buildings can be saved and put the cost at about $20 million. In a city where the cost of projects now reach into the billions of dollars and public subsidies to corporations and developers run into the hundreds of millions, it is rather hard to keep a straight face when public officials protest that $20 million is simply too much money. Why the rush to destroy a small, yet important, piece of our history? One would have to ask Councilman David Yassky, who had appeared to have shed his anti-preservationist skin after helping to de-landmark 184 Kent Avenue in Williamsburg but appears to have relapsed, or Borough President Marty Markowitz, who has been pro-demolition all along at the Navy Yard. Why is preservation of an asset for future generations less important than building a supermarket parking lot especially when some thoughtful planning and architecture could achieve both goals? It was rather disheartening, to say the least, to watch so many officials--including several that we respect--cast the issue in terms of jobs and groceries for low-income people vs. preservation. Brooklyn has lost too much history because it's more expedient to tear things down than to find creative solutions and we have lost patience with the elected officials who, in effect, push the start button on the wrecking ball. We hope the Federal government requires the city to find a way to save Officer's Row as a condition of giving away the land for development. Officer's Row should be a line drawn in the sand, and if our own elected officials aren't responsible enough to be caretakers of our history--and it really pains us to say this--the Federal government should do for them. Enough is enough. Save Officer's Row so our children and grandchildren can enjoy this little piece of Brooklyn and American history instead of parking their cars on it. I am with you all the way! It always amazes me how short-sighted and uncreatively efficient these developers are. Why is "Old" always frowned upon? And why is there no character or trace of history in the design of new building projects, both aesthetically and programmatically? I would love to see a truly creative problem solver with the resources to take on a project like this - or not take it on at all in its defense. I really cringe when I think of how many big developers who have the money to address these historic spots display an attitude towards brooklyn that is totally ignorant of its history or charm - brooklyn is not a "car" city - at least not these areas being contested (Red Hook Ikea, Navy Yards, etc.) These are classic urban pedestrian areas grown from the vein of public transportation - giant parking lots and faceless condominiums do not become us. 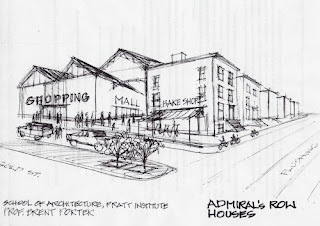 So irnonic to hear you put your faith in the feds to save admirals row. The Feds are the ones who have ignored amdirals row for the last 30 years and allowed them to get to this point. On the other hand, the resot of the Navy Yard, which has been owned by the City for the past 40 years, has seen alot of money infused into it and is generally good shape and it being put to good economic use housing over 200 businesses. Why all of sudden do you think the Feds are the good guys?